My husband Alan and I were both in our 50s when we made the decision to move to Chiang Mai for six months to see if life overseas was for us. We were in search of more adventures and a lower cost of living—and having kissed goodbye to life in Brisbane we found both here in Thailand’s “Rose of the North”. We live in a fully furnished, one-bedroom apartment in a modern complex with a communal swimming pool and gym. The best part of our apartment is the balcony, where we enjoy watching the sunset over the mountains and city of an evening. Our rent is $900 a month and we spend around $40 on power, $10 on water, $20 on broadband internet with unlimited downloads and $10 on our mobile phone plan per month. We have a small kitchen but rarely use it because it’s cheaper to eat out. Our apartment is surrounded by restaurants, cafes and markets and is within walking distance to most amenities. Chiang Mai is a cosmopolitan city that features cuisines from all over the world. My favourite spicy noodle dish, Khao Soi, costs 75 cents from my local market. I buy most of my fresh fruit and vegetables there too, a large bag of tomatoes costs just 75 cents. Restaurant meals start from around $3.75 and Chiang Mai also has a very trendy cafe culture, we often enjoy a morning latte and cappuccino for around $2.40 each. You’ll also find ultra-modern movie theatres where you can enjoy the latest films in English for the princely sum of $4.50; even less on discount days. On nights out, you’ll be spoiled for choice with venues offering free entertainment showcasing some of Thailand’s most talented musicians. The low costs and the fact Chiang Mai has a lot going on are great, but they’re not the only reasons we moved here. As soon as we got off the plane we found the Thai people were friendlier and more genuine than anywhere else. And the welcoming expat community is thriving here too. The Chiang Mai Expats Club were on hand to ensure our move ran smoothly from the off, they put us on to real estate opportunities and answered any questions we had. Our first year here has been so easy. A typical day starts with a walk to the local market to buy breakfast and fresh produce. Back at home we cool off by taking a swim in the pool. Then we might meet up with friends for lunch, join in Expat Club activities or explore the hidden treasures of Chiang Mai such as Warorot Market, a colourful spot selling everything from fireworks to fabric. In the evenings we’ll enjoy dinner at one of our favourite restaurants. We don’t have a car or motorbike and don’t feel we need one. Living in the city centre, we walk or use public transport. We use a songthaew (red bus) for as little as 75 cents around the city, a little more for further afield. The countryside around Chiang Mai has some spectacular scenery, so we often hire songthaews for $15—or minivans if going with a group—for day trips. Our most recent was with some friends up to the mountain-top viewpoint of Mon Jam. After enjoying spectacular views and lunch we visited the Maesa Elephant Park and Pongyang Zipline and Jungle Coaster. Chiang Mai’s medical and dental facilities are outstanding and services are a fraction of the price of those in Australia. You can be referred to a specialist and have tests taken and results returned on the same day. Alan recently had dental work done at Elite Smile Dental Clinic and the final bill was $710 for a root canal, X-rays and a crown. He was surprised not only by the price but by the fact that it was pain free. Thailand requires a visa, which you can get in Australia. We chose the retirement multi-entry visa which is available to over-50s and entitles you to stay in Thailand for 12 months. It can then be renewed for a further 12 months. Forms and requirement details can be downloaded from the Thai Embassy website. Once completed, we sent the forms and our passports to the Embassy with the visa fee of $225. 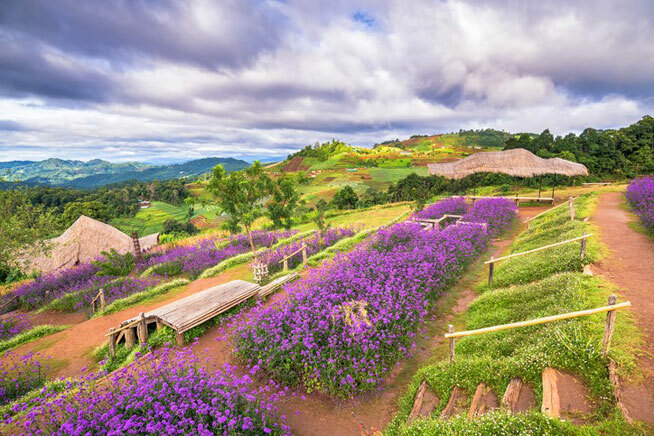 Living here has also allowed us to explore more of what Thailand has to offer, we have discovered the beauty of Phuket’s beaches, the Northern Thailand mountain vistas of Pai and Mae Hong Son and the fast pace of Bangkok. We have also discovered that we are adaptable—moving to a different country takes an element of courage but the adventures we have had are our reward for taking that first step.